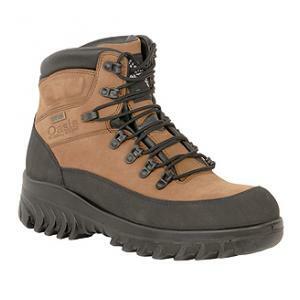 Fully integrated GORE-TEX® lining offers superior waterproof protection without compromising breathable comfort. Water resistant full grain nubuck leather upper. High abrasion rubber rand along the perimeter of the upper provides resistance to cuts and damage to the leather from sharp rocks or other protruding objects. High impact non-metallic speed laces. Full gusseted tongue with glove leather side wings and sprung design to aid in closure and fit when laced. Glove leather padded top collar. Functional padded impact pods around ankle area.